Courtland Sykes and the Facebook Post Heard ‘Round the U.S. I don’t often write about individual politicians. I typically reserve my comments for issues and concepts. So congratulations to Missouri US Senate candidate Courtland Sykes for making such a controversial statement this season that it’s drawn even a hibernating Observational Ginger from her cave. 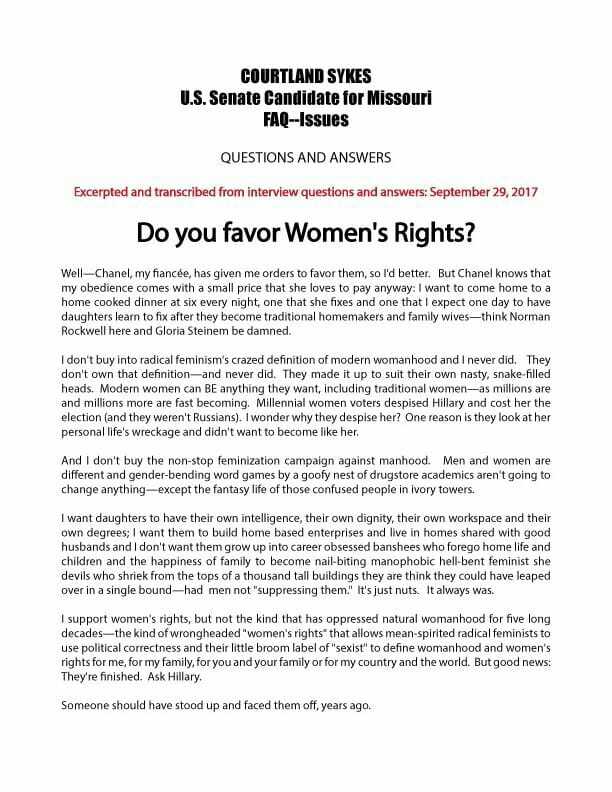 Cortland Sykes, who wants the good people of Missouri to make him their political representative, made the above-linked statement when asked what he thinks about women’s rights. In the interest of thinking through issues and encouraging voters to be thoughtful and discerning, let’s do a quick-and-dirty breakdown of Mr. Sykes’ logic and rhetoric to see whether he’s fit for office or not. Early in the statement, Sykes says, “modern women can BE anything they want.” But that’s a little confusing when he has just assumed, in the previous paragraph, that his daughters will be traditional homemakers. If he’s genuine in saying that modern women have choices, why does he presume to know the course his girls will take? Here begins an ongoing theme in Sykes’ statement. He mentions “radical feminism” and “modern” definitions of womanhood in a negative light—frequently—but never defines what he thinks radical feminism is or why he disagrees with it. Occasionally he’ll throw out clues and leave us to fill in the blanks, but that isn’t helpful to an informed voter who wants to know what specific issues a candidate does and does not support. Later, Sykes claims feminists “made up” this definition of womanhood (which he disagrees with) to suit their own purposes, but good luck figuring out what that definition actually is. “Millennial women voters despised Hillary and cost her the election,” Sykes says. Is this claim true? “Millennial women” is a huge demographic, and I’m pretty sure sub-groups within that demographic (such as race and class groups) displayed different voting tendencies. Plus, that broad statement is painfully easy to disprove. You don’t have to look far to find Millennial women who were involved in anti-Trump rallies and wore “I’m With Her” T-shirts. So why did Sykes make this easily-disprovable statement at all? Here’s one possibility: Hillary is a high-profile example of a woman who pursued her own career, and believed that she had a right to devote her life to professional work. But Sykes, like many men with demanding careers, benefits from the belief that a woman’s place is in the home, because it allows his household and his family to revolve around his vocation. It’s in his best interest to believe that the next generation of women truly want to serve their husband’s agenda, and so he wants to believe that they hated what Hillary stood for. He wants others to believe this, too. That doesn’t make it true, though. I’m not sure what he means by “personal life’s wreckage,” but one could reasonably assume he means Bill Clinton’s infidelity. Yet Bill was the one who cheated, not Hillary, so I’m not sure why he thinks Hillary’s behavior was the problem and should be avoided. Perhaps Sykes means to say that a woman’s ambition will cause a rift in her marriage and push her discontented husband to cheat. Many men do make this argument. Sadly, again, it’s embarrassingly easy to prove that wrong, given how many working women in our society do not end up cheated on or divorced. Most rational people understand that unfaithful men make bad choices independent of their wife’s behavior, so I’m not sure who Sykes is trying to fool. Is he himself ignorant about how a man’s personal responsibility works in marriage? Sykes fails to explain or define what this “campaign against manhood” is, so it’s hard for an informed voter to have any idea what he actually believes or supports when it comes to women’s and men’s issues. I Googled “drugstore academics” to see what those are, and got no meaningful results. So, again, if he would define what “gender-bending word games” are, and what specific political platforms they represent, it would be easier to tell what he stands for and against. But he doesn’t define it, either because he’s lazy or because he hasn’t thought through any of this very well. Neither quality recommends him for public office. I feel like I’m being too mean, so let me mention something he’s good at: using buzzwords. Specifically, buzzwords that don’t meaningfully clarify his position. I’m sure his jab at “people in ivory towers” had all those people (whoever they are) shivering in their boots. Good, then you agree with the feminists you keep claiming to disagree with. Also, the Oxford comma called, and it misses you. But Sykes goes on to say that he wants those daughters to “build home based enterprises” and not grow into career obsessed banshees. But he doesn’t. He gives lip service to women earning degrees and having choices, then assumes they won’t use them outside the home. He also sets up a false dilemma when he implies that women either love their families and don’t care about an outside career, or choose an outside career and turn down family life. Obviously, women can have careers and choose to love their families. His positioning of the two things as opposite goals is not only a lazy way to argue, but it makes me concerned. Someone running for office should be much better at logic and rhetoric than falling back on such basic logical fallacies. If he had been in my English 101 class a few years ago, I would have flagged that as a rookie mistake—and this guy wants to lead the public? Sir. You really need to proofread things before you post them in public. Again: this guy is running for office? I’m curious where Sykes gets his definition of feminism from. 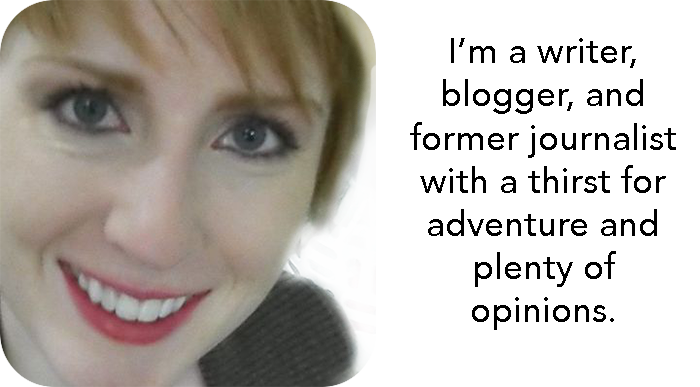 Can you find some feminists who seem “manophobic” and are unpleasant and irrational? Sure, just like you can find unpleasant and irrational people within any subgroup of people. In general, though, feminists are concerned about the ways in which gender influences our decisions and perceptions, without us realizing it, in ways that unfairly disadvantage women. That’s a far cry from being banshees who scream about fake oppression. In fact, if you really start looking into feminist arguments, they’re quite rational. A great many feminists are married or in loving, committed relationships with men. Many of us have fathers who are awesome. This entire attempt to misrepresent feminism as man-hating insanity is simply wrong, and makes Sykes less credible as an orator and politician. I suspect, again, that Sykes’ definition of feminism has more to do with his convenient belief in women serving men than it has to do with genuine engagement he’s had with the feminist agenda. Should we elect someone whose response to difficult issues is to misrepresent and name-call? No matter your particular beliefs about feminism, does that attitude seem helpful for a civil servant and political leader? TO REVIEW: WHAT DOES HE ACTUALLY STAND FOR? This is telling us literally nothing about where he stands on particular issues, what he thinks women’s rights are, what he does not think women’s rights should entail, and how he would lead when issues of women’s rights come up. Actually, I take back that last point. This tells us exactly how he’d lead when issues of women’s rights come up. He’d lead by applying the same level of ignorance, incuriousness, and refusal to truly engage that he has demonstrated up to this point. That last statement I quoted makes me think that Sykes is in a bubble, out of touch with the reality of everyday people. It’s hard to spend any time with Millennial women today and think that feminism is dying, or even struggling. This is another case of Sykes wanting something to be true and thus saying it’s true in the face of opposing evidence. Dude. Where have you been? Guys like you have been saying things like this from the beginning of the feminist movement. Believe me, people have “faced them off” quite a bit, but feminists are still here. This is another example of Sykes saying something that is inaccurate and lazy. So, to review: he creates straw men instead of engaging true issues, he claims to support women’s rights but clearly wants them to make the traditional choices that he deems appropriate, he doesn’t outline his specific beliefs about issues coherently, he speaks in a way that sounds juvenile and uneducated about very serious matters, and he doesn’t use the Oxford comma, arguably the Lord’s greatest gift to the phenomenon of language. What kind of monster snubs such a divine instrument of grammatical precision? But, you know, if you’re conservative and live in Missouri and want to be responsible for this guy having the power to make important decisions, it’s your funeral, I guess.